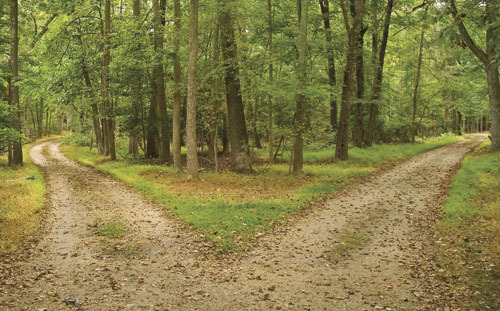 Ever heard “two roads diverged in a yellow wood”? We have too. Well schooling is like that, life in general is. You have two choices when it comes to attitude. It’s perhaps sad but true-there will be courses you don’t like, a professor with whom you fail to connect. Even if you have a wide range of interests and you can get along well with almost everyone, at some point you’ll have to make it through and rough class. You can take one of two routes when this happens. Route A: you can think of every excuse imagine able not to do the work or go to class. You can blame your attitude on the professor or the ‘boring’ material that you are expected to learn. Consequences of route A: a poor course grade, feeling bad about yourself, and having to work doubly hard in another course to bring up your overall grade point average. Route B: acknowledge that you really don’t care much for the course or the professor. It’s one course, however, and you can make it through. Study with someone who seems to like the course. Try to motivate yourself with small rewards. Tell yourself that this is temporary and the course will soon be over. Consequences of route B: perhaps you will not earn an A in the class but you will emerge with your ego and your grade point average intact.